I shared some info on this on Facebook. Last year Kim and I decided we wanted to do solar photovoltaic on our home. We knew we had a nice, south-facing open roof, it seemed big enough, and we all see fairly frequently articles on how cost of solar is dropping, so we took the plunge and started looking at options. In our town there are many people with solar; I can see 1 such home from my back porch, and SF writer acquaintance of mine Jeff Carver also has a solar system. Asking about online I saw that there were two active solar installers used by people in Arlington, one of which is Sunbug Solar. Anyway I contacted Sunbug, the other outfit, and yet a 3rd, state-wide installer I found online. The other outfit never got back to me, and bachelor #3 seemed technically not very savvy, so I went with Sunbug. What do I mean by “technically not very savvy”? I’m no expert in solar systems, but I can use Google, and I know that there are different grades of panel with different efficiencies, and that there are different ways of gathering the DC output of the panels and turning it into AC, which is what your house needs. The non-savvy solar people could not answer a single question, they had a set system they were pitching me, take it or leave it. Meanwhile the folks at Sunbug seemed to like talking about this stuff – were excited, even – and that made the decision to go with them very easy. 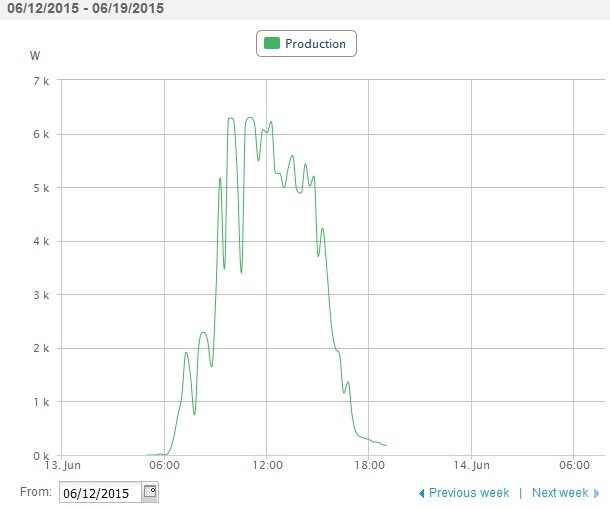 Power generation reaches close to peak at about 10 am and stays there 3:30 pm or so, then drops. The highest output I yet have achieved is 7 kW. 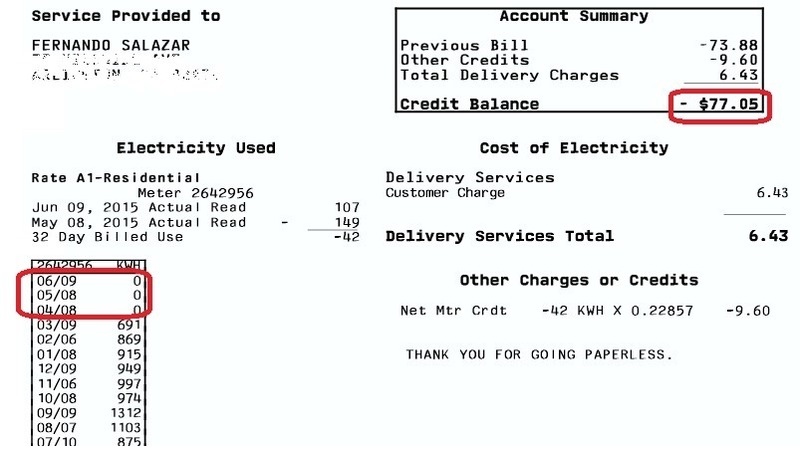 Anyway the system makes more electricity than I use – thus my negative electric bill for last 3 months. I may not stay negative all through the summer – in the hot months I run dehumidifiers in my basement and they draw considerable power. Of course all this is not free. The system, fully installed, cost just under $39,000. But right off the bat you get a Massachusetts rebate of $1,250, and a federal tax credit (not deduction) of 30% of your costs, plus a $1,000 Mass State tax credit. All this put the upfront cost at about $25k. But there’s more! Massachusetts supports SRECs or Solar Renewable Energy Credits. In brief outline, SRECs work this way: Different states want to encourage use of solar. They therefore require utilities to show a proportion of their output comes from solar. Utilities can do the generation on their own and meet the regulatory requirement that way, or they can buy from me the right to put forth my solar generation as credit towards their obligations. SRECs are traded in a market like commodities and their prices will fluctuate based on plain ‘ol supply and demand. Essentially utilities pay me to generate my own electricity by solar. Bottom-line: Even with the minimum forecast prices for SRECs, my capital costs for the solar system will be recouped in 6 years. For the 24 forecast years of system life after that, it is free electricity, no electric bills, and maybe even a small surplus. Certainly this won’t be for everyone. 6 years seems like a short time to me but it may be an eternity to you. And as fun as is is to gloat over a $0 electricity bill, you may have other more pressing needs for your money. Finally be aware there’s other ways to get into solar than owning the whole show, like leasing the system.